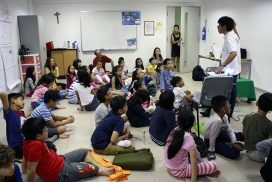 Catechesis is not just about sacramental preparation for Reconciliation, Eucharist and Confirmation; rather, it is part of an initiation of a young person into the entire Christian life, which culminates with initiation for community and mission. A catechist's goal always is to set hearts aflame for Christ. Many things can take place at a typical session, from breaking the Word to craft sessions to sharing time. Catechetical sessions are held every Sunday. All sessions have been prepared, Catechists only need to deliver the session. Of course, there will be different ways to present the same session, therefore the need to discuss, plan and pray over the sessions. There may also be times when we meet for fellowship, and to attend retreat or day of recollection.